WIW 1/28 FFBO: "A confusion of ...	Are these "old lady" clothes? 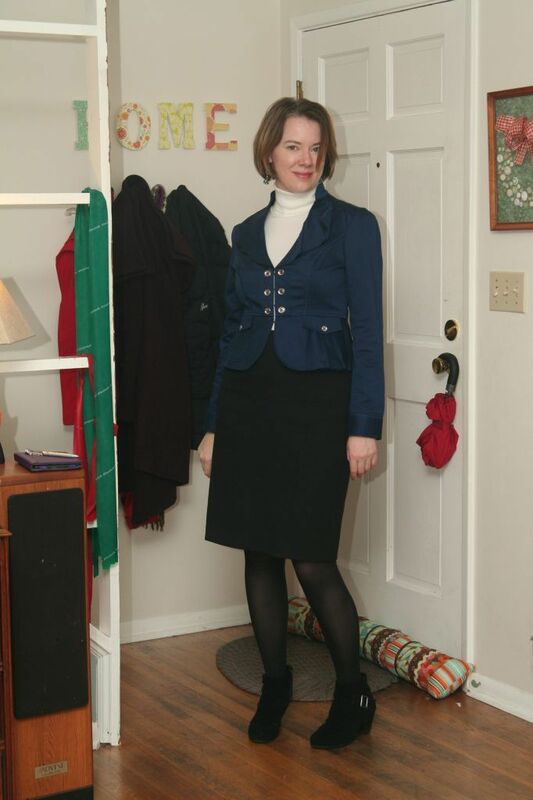 So I threw on my White House Black Market ink blue jacket over my black and white striped top (one of the few still long enough to cover my huge belly) and my stretchy black midi tube skirt. Neither of these pieces are maternity but they're both super stretchy. Of course, I can't close the jacket at all, but it's still fun to wear. And what fun to discover that I was twins with Amy today--she also wore the WHBM jacket with black skirt and black booties! We had talked a long time ago about doing a twin day but never got around to it...and now we are unintentional twins, thanks to Angie! You look fantastic and I think your bump is the cutest accessory *ever*! You look wonderfull! Love that jacket. Pregnancy must be agreeing with you as I can't get over how glossy your hair looks! You look amazing! 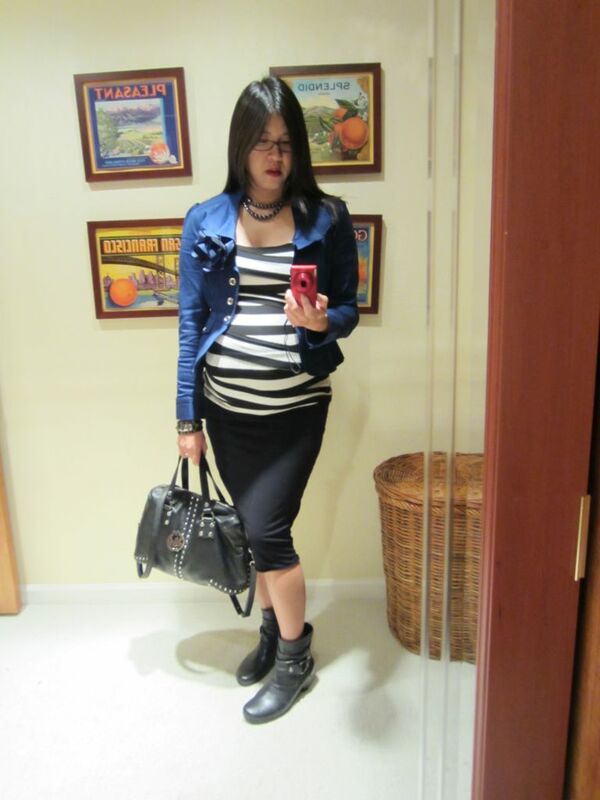 I wish i had half of your style during my pregnancies (those were dark times for me)! You twins look amazing! And I love those bias stripes cuddling your bump --- fun! You know, you did some very clever purchasing the last few years, Natalie, to have so many regular options that still work! I know, because most of my currently-fits wardrobe is probably younger than yours, and I *still* have only a couple of tops that are long enough. Both your version and Amy's are beyond fab! You are rocking some UWP here. Looking very UPW there -- I love it. Sometimes it's hard to tell the difference between navy and black but the black and white graphic print juices up the blue and really makes it pop. Lovely! I love that graphic black and white top with the navy jacket. Great outfit! Thanks Katiepea, Diane, Rute, Manidipa, Karie, Beth Ann, Day Vies, Amy & Sara! Manidipa, I agree, top length is the hardest obstacle to overcome with repurposing non-maternity wear during pregnancy! I am down to just a few tops too! Most of my wardrobe is less than 1-1.5 years old (since I joined YLF). I really didn't want to buy a whole lot of maternity clothes since this is my last pregnancy, but I don't really love my old maternity clothes anymore either. I actually have bought a number of new clothes since I got pregnant, but most are non-maternity because I'm hoping to still wear them afterward. They're mostly tunics, long sweaters, stretch waist ponte skirts, etc. Beth Ann and Day Vies, thanks for saying it looks UWP! I was wondering what to call it, compared to Amy's Posh Eclectic. Amy--I'll do twin day with you anytime! I love your style!